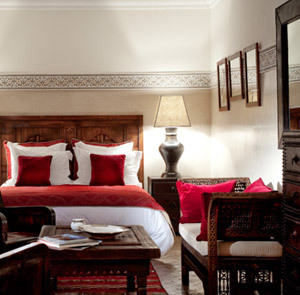 Key to the appeal of a riad hotel is the contrast between its city surroundings — in this case a busy neighborhood at the edge of the Medina — and the serene atmosphere within the riad’s walls. 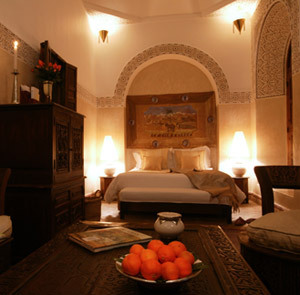 Behind a heavy carved wooden door on the rue Sidi Mimoun lies La Villa des Orangers, a pair of early 20th-century residences surrounding a pair of tranquil courtyards, one with an eighteen-meter heated pool, the other with a babbling fountain and a scattering of sofas and armchairs. 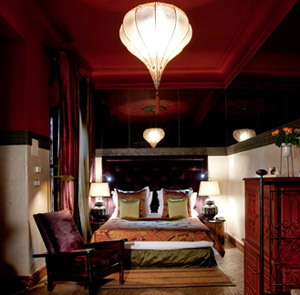 The guest rooms are spacious and elegantly appointed, decorated in a traditional Moroccan style, full of ornate plaster work and delicately carved wooden furnishings, as well as modern bathrooms with separate tubs and showers and spa-quality amenities. 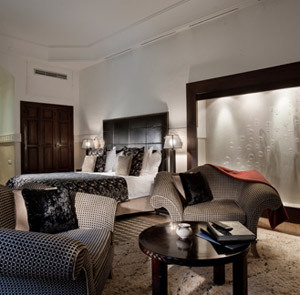 The suites add an additional measure of space, obviously, as well as the added luxury of private terraces facing the courtyard. 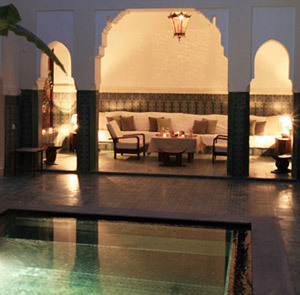 Dining is a treat, with traditional Moroccan cuisine served in the opulent dining room or in any number of more secluded salons, patios and nooks throughout the hotel’s grounds. A rooftop terrace (complete with a second small plunge pool) offers stunning views of the mosques and buildings of the old city, and in the distance, the Atlas Mountains. 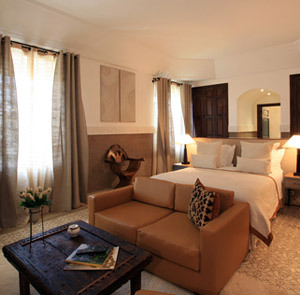 How to get there: Villa des Orangers is approximately a 15 minute drive from Marrakech-Menara Airport. Please contact customerservice@tablethotels.com to arrange airport transfers.